Coglink is e-mail software designed for use by people with intellectual disabilities. This is a review of it. I purchased CogLink for $49. At the time of this writing, this is a one-time cost. There are no continuing subscription fees. This is surprising given that a great feature of this product is toll-free, live technical support from 9 AM – 5 PM (PST). My understanding from a conversation I had with a CogLink staff member is that the project is currently grant-funded. This helps explain why the live technical support does not have to be funded by subscription costs. Coglink is intended to be managed by a “Helper” who installs it and provides at least some initial help through its training and use. Helpers may log-in to a Web site to enable and to disable CogLink’s advanced features, and to set up the people, called “Buddies”, with whom its user will communicate by e-mail. Statistics are presented on the last time the e-mail software was used and the last time an e-mail message was sent. There is an option to receive monthly usage reports. Coglink’s interface is clean and simple. A text instruction always appears at the top and a list of “buddies” is always on the left. Contextually-relevant buttons are located at the bottom. 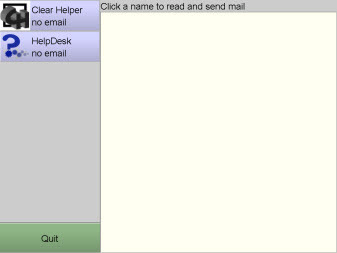 The opening screen instructs the user to “Click a name to read and send mail”. 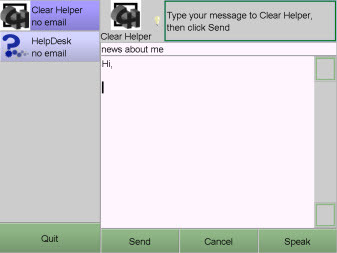 A click presents the user with the same simple interface, but with a message text composition box on the right. As the user types a word, a menu box of possible words appears. The user can choose one, which is then entered into the message. This word-prediction feature can be disabled. A button at the bottom will speak aloud the message text at any point. When done, the user can simply click the “Send” button or the “Cancel” button. I believe CogLink is easy to use by its intended customer base. It has many customizable-, accessibility- and safety features. CogLink has “Pack”, a portable version contained on a USB drive. It also has a version called “TeenMail” with social-connection features for teens with intellectual disabilities. For a review of the training that accompanied the Coglink e-mail software, see my blog post entitled “CogLink E-Mail for People with ID: Review of Its Training“. No endorsement is intended or implied for CogLink. This entry was posted on 2009/12/17 at 11:18 AM and is filed under Assistive Technology. You can follow any responses to this entry through the RSS 2.0 feed. Both comments and pings are currently closed.